Scandinavian-inspired design meets high quality construction in this stylish and modern sofa collection. Our Cooper range is designed with Scandinavian style in mind. It's all about the simple details, with a sleek and modern silhouette that boasts high quality construction and supreme comfort. The upholstery comes in a range of light and easy fabric colours, all with coordinating subtly-patterned scatter cushions. Sofa cushions are plain-fronted with a think piping around the edge for visual interest. 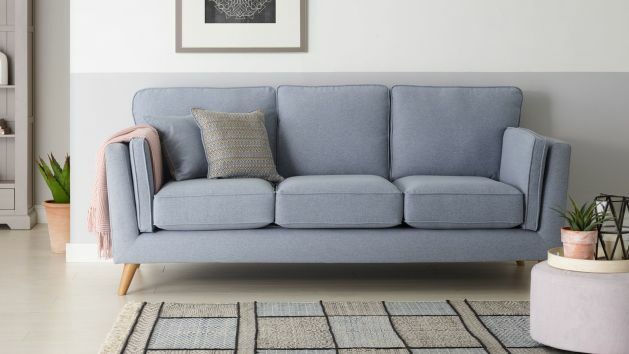 Each of the Cooper sofa sizes has a light and airy feel to it, thanks to the slim turned oak feet which support them, and also coordinate in tone with our living room furniture range. Browse all our Cooper pieces today to find sofas, perfectly suited for modern homes.